Chanteur Country US né le 1er Décembre 1931 à Bishopville (Caroline du Sud). US Country singer born on December 1, 1931 in Bishopville (South Carolina). 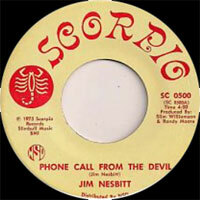 Jim Nesbitt was a South Carolina deejay who had a flair for tongue-in-cheek humor. This talent put his name on the Country charts thirteen times between 1961 and 1970. Many of his songs tended toward Talking Blues and recitations, but most displayed a clever wit-often directed to political satire-which delighted numerous radio and live audiences. 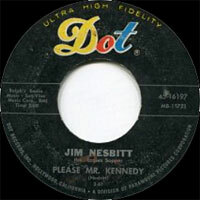 Little detail is available on Nesbitt's life, but during his years on the charts, he worked as a deejay at WAGS radio in his hometown of Bishopville, which was some twenty-five miles west of the larger city of Florence. There he made television appearances with Slim Mims and his Dream Ranch Boys. 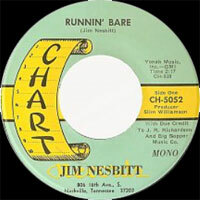 Jim recorded initially for Dot and then for Chart, the same company that would later elevate Junior Samples to his first taste of fame. While Jim never got the national television exposure that raised Samples to star status, he did do much better on the record charts. 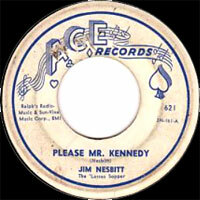 His initial appearance in front of a national audience came in the spring of 1961 with Please Mr. Kennedy, which reached the Top 15. The song, based on The Ballad Of Davy Crockett, was initially released on Country Jubilee and Ace, becoming a hit on Dot. Two years later Livin' Offa Credit made a brief appearance. 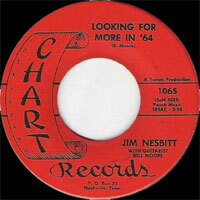 However, his biggest number came in 1964 on Chart with Looking for More In '64, which remained on the charts for nearly six months and reached the Top 10. Done in a Talking Blues style, the single satirized the level of rising expectations that resulted from the current presidential election. A North Carolina gubernatorial hopeful, Dan K. Moore, used it successfully for a campaign theme. It inspired a series of sequels: Still Alive In ‘65, Heck of a Fix In '66, Clear the State in ‘68 and Having Fun in '71, the first two of which also charted in the Top 40. 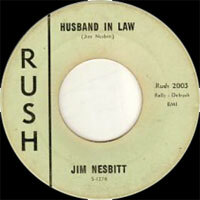 In between these singles, Jim had other humorous ditties like Mother-in-Law (Top 20, 1964), A Tiger in My Tank (Top 15) and The Friendly Undertaker (Top 25) (both 1965), You Better Watch Your Friends (Top 50, 1966) and Runnin' Bare (Top 20, 1970). 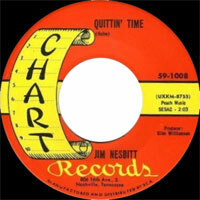 Other songs by Jim poked gentle fun at the problem of [Air] Pollution, Spiro [Agnew] and Social Security. His name vanished form the charts after 1970, but he came back with an album titled Phone Call From The Devil, in 1976 (undoubtedly a reaction to Jerry Jordan's Phone Call From God). After that, Nesbitt seemingly dropped from the national scene. Bruce Jones of the Jones Brothers, a popular Carolina Bluegrass band, reports that a few years ago Nesbitt was located in Florence, South Carolina engaged in the mobile home business.